Desperate to escape the increasingly vehement persecution in their homelands, thousands of refugees from Nazi-dominated Central Europe, the majority of them Jews, found refuge in Latin America in the 1930s. Bolivia became a principal recipient of this influx — one of the few remaining places in the entire world to accept Jewish refugees after the German Anschluss of Austria in 1938. Some 20,000 refugees arrived in Bolivia, more than in Canada, Australia, New Zealand, South Africa — the leading British Commonwealth countries — combined. In Bolivia, the refugees began to reconstruct a version of the world that they had been forced to abandon. Their own origins and social situations had been diverse in Central Europe, ranging across generational, class, educational, and political differences, and incorporating various professional, craft, and artistic backgrounds. But it was Austro/German Jewish bourgeois society that provided them with a model for emulation and a common locus for identification in their place of refuge. 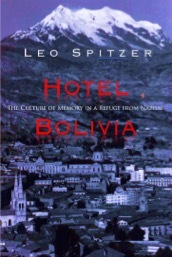 Indeed, at the very time when that dynamic social and cultural amalgam was being ruthlessly and systematically destroyed by the Nazis, the Jewish refugees in Bolivia attempted to recall and revive a version of it in a land thousands of miles from their home: in a country that offered them a haven, but in which many of them felt themselves as mere sojourners. Hotel Bolivia explores an important, but generally neglected, aspect of the experience of group displacement — the relationship between memory and cultural survival during an era of persecution and genocide. Employing oral histories, family photographs, artistic and documentary portrayals, it considers the Third Reich background for the emigration, the refugees’ perceptions of past and future, and the role of images and stereotypes in shaping refugee and Bolivian cross-cultural communication and acceptance. It examines how the immigrants remembered, recalled and reshaped the European world they had been forced to abandon in the institutions, culture, and community they created in Bolivia. In documenting life stories and reclaiming the memories and discourses of ordinary persons who might otherwise remain hidden from history, Hotel Bolivia contributes to a major objective of contemporary historical studies. But it is also directly concerned with theoretical issues, increasingly evident in historical writing, focusing on the contextualization of memory and the interdependence – and tension – between memory and history. In reflecting on remembered experience, over time and between people, the ultimate objective of this book is to contribute to the historical study of memory itself.